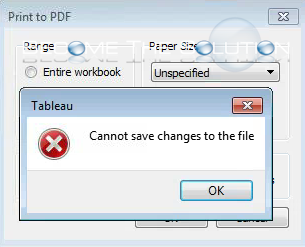 If you attempt to Print to PDF a Tableau report, you may receive an error message that prevents you saving any edits made. In this example, you export a PDF, it opens after selecting view PDF file after printing, and you decide to make additional edits. After making the edits, you print to PDF and receive a prompt about the same file name existing, do you want to overwrite. When you click yes, you experience the error message. Close the existing Tableau PDF report first before trying to save a new copy of the report. The error message is confusing since it does not tell you the other report with the same name is still open.